The Bidar Fort, earlier part of Hyderabad and now Karnataka, is more or less in ruins. However, this massive fort is so well maintained that it is a pleasure to spend a day there. Despite being in ruins, its splendour is enhanced with its well-maintained gardens. The city of Bidar and its fort are located on the edge of the Bidar plateau, the northernmost area of Karnataka. With an altitude of 2,200 feet, it spreads across an area 35-km in length and 19-km in width at its broadest part. Encompassing a total area of 190 square km, the fort is built in the shape of an irregular rhombus, on the edge of the plateau with sheer walls along its North and the East. 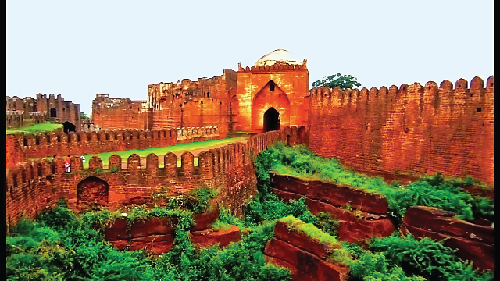 It is said that the old fort of Bidar was captured in 1321-22 AD by Prince Ulugh Khan of the Tughlak Dynasty –- who later on came to be known as Sultan Mohammaed Bin Tughlak of Delhi. With the establishment of the Bahmani Sutanate in 1347, Bidar was occupied by Sultan Ala–ud-Din Bahman Shah and during the rule of Ahmad Shah (1422–1486), Bidar was made the capital city of the Bahmani Kingdom. Under Ahmed Shah’s rule, the old Fort was rebuilt with beautiful mosques, madarsas, palaces and gardens. Its reconstruction began in 1429 CE and was completed in 1432. The Bidar Fort is 1.21 km long and 0.80 km in breadth and the length of its walls measure 2.5 km on the outside. At the time, gunpowder had not reached peninsular India and the long and winding fort walls were constructed out of stone and mortar by Persian and Turkish architects. The stones came from the deep moats that were dug outside the fort walls. This is probably the only fort that has a triple-channelled moat --three separate moats circling its walls. To make it safer from attack, there are 37 bastions on the fort walls -– cannons are still seen welded to metal hoops and mounted on the bastions. Another unique and historic feature at the fort is the use of a water harnessing technology that originated in Persia. Referred to as the ‘karez water supply system,’ the technology was brought to the Deccan by the Bahmani rulers in the 15th century. The karez system was built in Bidar, Gulbarga, and Bijapur in Karnataka and also at Burhanpur in Madhya Pradesh. In 1619, Bidar was captured by the Bijapur Sutanate, but fell in 1657 to Aurangzeb who was at the time, the Mughal Viceroy – formally absorbed by the Mughal Empire in 1686. In 1724, Bidar became a part of the Asaf Jahi Kingdom and Nawab Mir Sayid Muhammad (also known as Salabath Jung) ruled from Bidar Fort from 1751 to 1762. During his rule, Bidar was known as Mohammedabad. In 1956, when the state of Hyderabad was partitioned, Bidar fort became part of the newly formed state of Mysore and now Karnataka. With the establishment of the Bahmani Kingdom in the Deccan from 1347, architectural styles of Persia became popular. Their influence can be seen at ancient structures in many parts of India. Among the most prominent monuments at the Bidar fort is the Rangeen Mahal (Coloured Palace), specially built for the Queen, its grand entrance surrounded with walls covered with mother of pearl inlay on jet black basalt stone. This beautiful two-storied Palace built by Mahmud Shah in 1487, is a well designed and splendidly decorated structure, with carved wooden pillars and walls covered with coloured tiles. Carved woodwork and ceilings inlaid with mother of pearl makes its decoration very special. To keep the heat at bay, there are water channels with fountains and a cistern in the middle as well as underground rooms. The Gagan Mahal was built by Bahamani kings during 14th and 15th century AD. But later the Baridi Shahi rulers made a number of additions and alterations in the plan of the building mainly in the upper storey of the southern part of the palace. The architecture of this massive structure may be considered as a “combination of strength and beauty”. The rooms belonging to the ground floor of the palace are said to have remained as before. The palace has two courts, the outer one apparently used by the male staff and the guards of the palace and the inner one for the royal ladies. The main building of the palace lies to the south of the inner court and was used by the Sultan. On the southern side of the court is a series of rooms and halls built in rows one behind the other. There are arched entrances to these rooms and it has also been said that they were earlier embellished with stucco and coloured tiles. The most interesting and splendidly built structure at the Fort is the Solah Khamba Mosque – named thus because its prayer hall has 16 pillars. This mosque is Bidar’s oldest Islamic building and one India’s largest mosques. Set in the midst of a garden, this beautiful mosque built in 1423 was restored by Aurangzeb in 1656. It is considered a good example of the Deccan style of architecture – with the mosque’s large prayer hall is divided into aisles by massive circular columns crowned with a huge dome. Water was collected in a reservoir on the roof and then distributed to cisterns on the ground floor. There is also a small but well-maintained museum, which was earlier a ‘hamam’. It contains interesting souvenirs from earlier times. These include huge fort locks that were probably used at the seven gates of the Fort - the Mandu Darwaza, the Kalmadgi Darwaza, the Delhi Darwaza, The Kalyani Darwaza, the Carnatic Darwaza, and two others that are nameless. Outside the Fort, life continues like that in any small town or city. There are some interesting places to see and to begin with there is Mohammad Gawan’s Madrasa, which stands in the centre of Bidar’s old town. Built in 1472, it is a three-storeyed structure with a minaret, a mosque, laboratories, lecture halls and students rooms. Gawan was a learned man and brought together scientists, philosophers and theologists to create a religious place of study. It is said that Gawan who was from Iran, came to Bidar in 1453 and rose to become one of the governors of the Bahmani Dynasty. The Chaubara is a tower like structure, which might have been a fortified watchtower and stands at the centre of the Old Town. It could have been a fortified watchtower. To the west stands Khanquahs -- Muslim monasteries to provide prayer rooms. To the south of this is the Jami Masjid. Outside the city is the huge Guru Nanak Jhira Sahib Gurudwara visited by none less than Guru Nanak. The impressive nine-tomb complex of the later Bahmani kings is further down the road at Ashtur. It’s best seen at sunset when it’s bathed in a gentle golden glow. Don’t miss the majestic tomb of Humayun the Cruel, scarred by lightning. The tombs for the potentates who succeeded the Bahmanis lie in a magnificent, spatial necropolis that spills over both sides of Udgir Road. The most beautiful is that of Quasim Barid, the man responsible for inciting Muhammad Shah Bahmani to execute Mohammad Gawan. Visit the somewhat melancholic tomb of Ali Barid Shah, who is interned with his 68 concubines, reputedly from various parts of the world. It has a number of monuments within the fortress complex. Prominent amongst them are the Rangin Mahal ("Painted Palace"), so called because of its elaborate decoration with coloured tiles; the Takht Mahal, or throne room; the Jami Masjid ("Great Mosque") and the Sola Khamba Masjid ("Sixteen-Pillar" mosque).